I've always been fascinated by pro-wrestling, even when I was still a child. Of course back then I didn't know that it was all a show. When I found out that it wasn't real, I lost interest and stopped watching (during my high school years). It was only during college when I started watching again, mainly because my younger brother has started watching it too. Since then, I've become updated with the show's happenings, and the wrestlers themselves. I even wanted to watch them when Raw and Smackdown went here last year. I wasn't able to go, but my brother was able to and he even got a picture with Triple H! When news of Eddie Guerrero's death broke out, I was shocked. Even more with Chris Benoit's murdering of his wife and son, and eventual suicide. What's more sad is that it was drugs that led to these wrestler's self-destruction. Watch the news videos to learn more about the double-murder suicide that happened in Chris Benoit's home over the weekend. Remember my Open-source woes? I'm still having them. I decided to try another Open-source CMS available in my webhosting package which seems easier to use. However, I find myself being stuck again. I'm trying out Xoops because they have this Xpress module which is supposed to be the WordPress for XOOPS, and the reason I'm interested in this is because Wordpress is supposed to have an easy-to-use migration tool for blog content from Blogger to Wordpress (now you know where my blogpspot is headed. hehe). So I downloaded the module and installed it, but when I go to the Wordpress page, I get this: "Fatal error: Undefined class name 'xoopslocal'". Googling gave several results pointing to the module developers' site, but unfortunately they seem to have exceeded their bandwidth limit. I found a forum stating that the version I have installed (Xpress 1.5.2 only works with XOOPS 2.2 (I have v2.0.16) but that installing the Frameworks will repair the problem. It still did not work. Maybe I have to work a little harder and smarter in attacking this problem. I'll give an update as soon as I find something out. Philippine Center for Creative Imaging - I want to enroll in their photography classes, ranging from their basic to specialized courses. Although for starters, I would like to enroll in The Alcove because they have lower fees and have after-office schedules. Studio 116 - If there's one talent I'm sure I have, it's dancing. Unfortunately, I've always put it in the background and have never actively cultivated it. I've never joined any dance clubs in school because practices tend to finish late and I had no way of getting a ride home. At least now, I can have the chance to have formal dance training if I enroll. I want to progress through the social dances because I think I'm stuck in hip-hop. Again, classes are after-office and I won't have any problem going home late because I get home late everyday anyway (curse you EDSA traffic!). Japanese Studies Program - I took Japanese as my foreign language elective in college and I even planned to pursue a Minor in Japanese Studies. However, my JSP102 Basic Japanese 2) professor was so terrible, I didn't learn anything from her so I thought I wouldn't survive Intermediate and Advanced Japanese if my Basic Japanese education was so poor. Now, I want to resume my Japanese language studies and I even dream of taking (and passing) the Japanese Language Proficiency Test. Classes are every Saturday so I have to rethink because that will eat into my precious weeknd. Meanwhile, I'll content myself with online resources and exams. PhilNITS Exams (JITSE) Review - I've always wanted to take the Japanese IT Standards Examination ever since I graduated. I even registered for the 2003 exams but I backed out when I saw the review materials. Half of the things in there, we didn't even cover when I was studying! Now, its name has changed but I still haven't taken it. At least there's a review center I can enroll in, if and when I decide to take it. I dunno, it's just something I need to prove to myself as a Computer Science graduate. Registered Financial Planners Program - Here's something I can go into if I decide to take a career shift - becoming a Professional Financial Planner. But for now, I just wanna learn so I can better manage my personal finances. The program fees are high though, so the education is an investment in itself. Stock Market Investing - Another finance-related class, this time about investing in the stock market. Trainings are scheduled on Thursday afternoons so I would have to take a leave from work if I want to attend. No seminar fees though so that's a plus! In a way, it's a good thing that I don't have the time yet to enroll in these courses 'coz then, I'll be worrying about the money. Hehe. I'm so glad I brought my digicam to the Canon service center at Chino Roces Ave. because it turned out that the problem I'm having with my shots (notice the reddish top border I took for the King Long and Tito Boy post) is due to the defective CCD sensors that is being recalled by Canon. I just have to wait 2-3 weeks because they say the replacement parts would still be coming from Singapore. 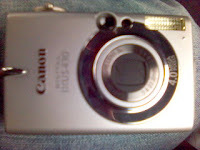 If it would mean that my digicam will be fixed, hopefully free of charge, then I'm willing to wait. If you have any ideas or suggestions how I can fully maximize my blog's membership in Technorati, just give me a holler. I'll let you in on a secret. The real reason why I arranged my father's postcards and why I want to sort those coins is because I want to chronicle his travels; I want to know what countries he has been to and when he was there. Who knows, someday I may be able to visit the same places he's been, retracing his footsteps in a sense. And when that happens, no doubt it will turn out to be a truly nostalgic journey for me. 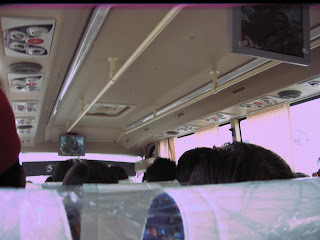 Notice the plastic still covering the seats? I noticed that too and I can't help but chuckle as I remember Rex Navarrete's comedy about Tito Boy's House. If you haven't heard or watched him yet, do try to catch him if he has shows in your area. I haven't watched him yet but I have all his CDs so I know he's really funny. Though, you'd have to be Filipino or be "related" to one in order to relate. Hehe. I'm on a roll here. Found a tool on Steve's site which tells how much a blog is worth. I followed the link and tested for my blog's worth. The result, as you can see on the left bar, is $3,951.78! Converted to our currency, that's equivalent to a whopping amount! Not bad for a blog that's roughly 3 months old. Godzilla invited me to exchange links with him and I willingly obliged. In fact, I created another section on my left-side menu called 'linked list' to accommodate his and others' future requests for link exchanges. I separated the exchange links from my 'friends' list to distinguish between my cyber friends and my personal friends. You will have to scroll a little further down though as I only managed to squeeze it in between the areas for our sponsors (you know you want to cl!ck !t. the @ds ! mean. hehe). To be honest, this multiple scrolling makes me want to apply a different layout to my blog; I'm thinking a 3-column layout. But I like this color scheme and I'm to lazy to find another one. Hehe. So what are you waiting for? If you think being connected through the MyBlogLog Community and Contact is not enough, and if you really, really, really, really want to be a part of this exclusive clique, add a comment to this post and state your blog's url so I can check if you've already added me to your blogroll then I'll add you to mine! Would you believe that I haven't watched Spider-man 3 yet? Well, I've watched bits and pieces of it while working out in the gym, but not the whole movie from start to finish. It's still showing in the movie theaters here though, but I don't know if I'm going to catch it. Also, I haven't watched Shrek 3 yet. But that I'll just probably wait to show on cable. The last must-see movie I haven't seen yet is Pirates of the Carribean: At World's End. This one I still have a plan to watch at the big screen but must be scheduled because I heard it's 3-hours long. I just hope that I'll still be able to understand it because I don't remember what happened in Pirates 2 anymore. Hehe. Mr. Bean's Holiday is also showing right now. But I wasn't able to watch the first Mr. Bean movie several years ago. Though I doubt I need to have watched the first movie to be able to understand this one. But I did watch Johnny English before. Would that count? Hehe. For the upcoming movies, the ones to watch out for are Fantastic 4: Rise of the Silver Surfer and Transformers. Good thing I was able to watch the first Fantastic 4 movie. And just recently, I was also able to watch the cartoon movie of the Transformers in DVD (again, this should not be considered as a pre-requisite as I'm sure that this Transformers movie would be so much different from the '80s cartoon. Harry Potter 5 will also be showing on the 3rd quarter of the year, I think. I've also forgotten what's supposed to happen on this fifth installment of the series based on what I've read on the book so I'll just rely on the movie to refresh my memory. This would also prepare me for Book 6 which I haven't read yet but I have already borrowed copy of from my coworker. So the sequence I should follow is watch HP5 at the movies, read HP6 and then find someone who can lend me a copy of HP7 when it comes out.